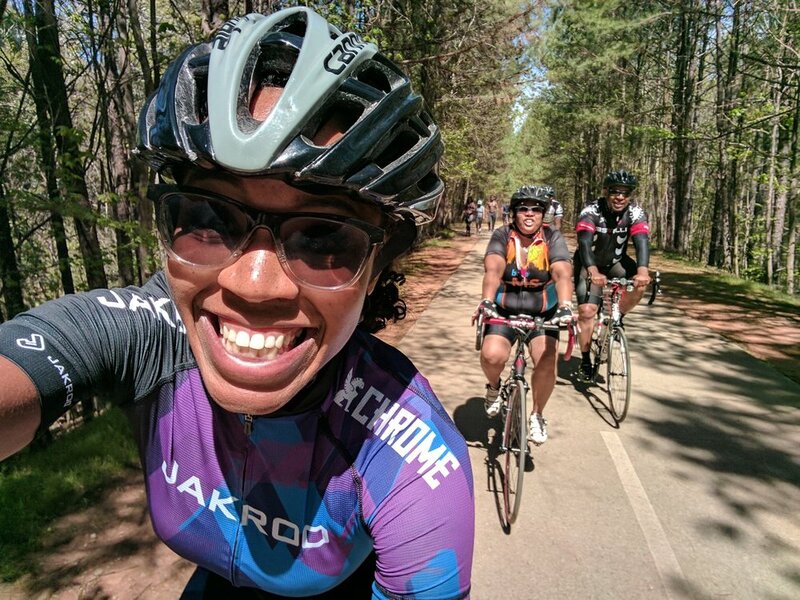 Ayesha McGowan is bidding to become the first female African-American road racer with a pro contract. We have seen female African-Americans push back boundaries in tennis with the Williams sisters, and at the Rio Olympics Simon Biles was a real revelation in the gymnastics arena. So this wave had to eventually come round to cycling. So when Ayesha was in London, in July en route to Belgium for some cycle racing I managed to scoot over to her base in East London where we met up one Sunday afternoon and she told me about her life as a biker in the States. I got into cycle racing in 2014 when I tried out the Red Hook crits. It was my first race - not the easiest race to start with, racing with a track bike on the road! This was the first time that they were doing a separate women’s race to encourage bigger fields, and it was super-fun. After my first Red Hook in Brooklyn, I did the one in Milan later that year (2014), and then again in Brooklyn the following year. I then decided to focus on crit racing, and I rode in the velodrome too. I am part of an elite state team, Jakroo Factory/Chrome Industries, which I got into when I was invited to join the team by a woman who races on the circuit with me. We’ve got big names in cycling - like Amber Neben, Coryn Rivera, Ellen Noble, Katie Compton who does cyclo cross. 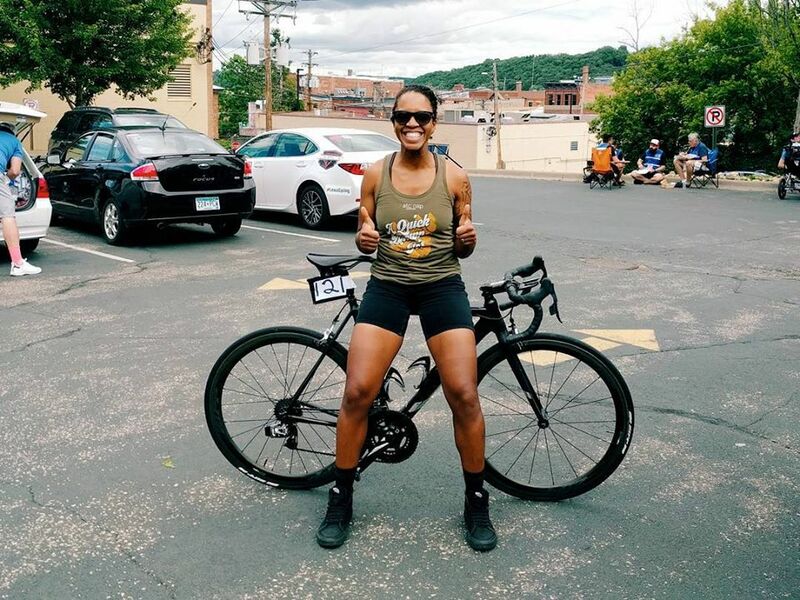 But when I looked to see which black girls are racing and I couldn’t find any I thought I would just do it myself and become the first black female pro road racer! The most racing experience I've had has been in criteriums, but I am working towards being a better all-rounder. I consider myself to be more of a sprinter, though I am also working on my time trialling. It didn’t feel like I had a particular “I’m becoming and athlete” moment. There was just a natural transition from someone who rode a bike all the time, to someone riding competitively. Even now I think of myself as just a cyclist rather than athlete, which is a strange balance really. I do many things in cycling and racing bikes is one of them. It doesn’t define me. I don’t think I have a defining thing. I teach music and get the summer off to go racing around the States and beyond. Also I work for a non-profit organisation that hires bikes for people with disabilities, and I manage a blog, as well as being involved in advocacy and campaigning for safer bike-riding. It's hard to juggle, but I focus my racing during those 2.5-3 months in the summer when I am constantly on the road. There’s only a handful of other black women racers that I know about who race in the lower categories. 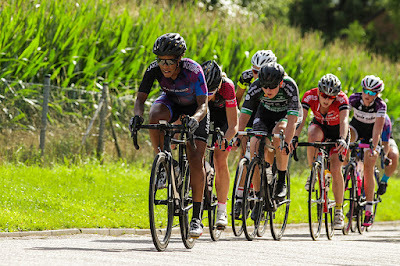 As it’s alarmingly rare to see black women racing, I can be a novelty to people. I’ve had someone call me a unicorn to my face, not knowing anything about me, or what I’m trying to do or what I’m trying to accomplish. He was just so surprised to see me that he called me a unicorn. It was like, well unicorns aren’t real – or if they are they are very rare. I just nodded and smiled and was very polite, but I wasn’t too pleased! I’m sure his intentions were good, but the impact wasn’t great. This doesn’t put me off racing, and I kind of understand why people would say things like that, but it doesn’t make it right. That’s why I need to do what I’m doing so it isn't a rare occurrence. People don’t see women like me very often... I’d get excited too....I saw a poster advertisement at a bus stop in London and it had a black woman on a bike, and I was like "yes"! And I was excited to see that! So I can understand people seeing me as a novelty, but I wouldn’t call them a unicorn! My family are really supportive, though my husband gets lonely and that’s hard. He rides but he doesn’t race, so he is at home while I am away on the road. My family is not sporty at all. I think everyone has played a sport in their life at some point, like at high school, but nothing beyond that. In many non-white cultures women wouldn’t ride a bicycle. People say “women don’t ride bikes” and that stays with you and then you feel that you can’t do it. You feel like there’s something wrong with doing it, and you end up passing that down to your kids and your friends. And when people see a woman riding a bike they think you are doing it because it’s not a choice, i.e. you can’t afford a car. But for me, it is totally a choice. People were saying to me “Why are you doing this? You can take a train or drive a car to get to places.” And I would reply, “Well, I don’t want to!” Now I do have a car as it is useful for getting to bike races. People are gonna think what they wanna think when they see me riding a bike, but if you keep on doing it it eventually becomes normal in their eyes too. Then they look at you and they say “She’s the one that rides a bike all the time!” They expect you to show up on a bike, and when you don’t it’s like "Whoa, what’s happened?!" My most memorable race in recent times was some weeks ago when I got lost in a road race in the middle of Minesotta. I wasn’t feeling great that day and I got dropped off the back. The peloton made a turn and I didn’t. Well, there was a police officer and he flagged me through to go straight on. He didn’t tell me to turn, and I didn’t think anything of it. I wasn’t too far behind the peloton, and I kept riding – then I didn’t see them anymore, and I began to wonder if I should stop and ask if they’ve seen anyone up the road. Eventually I asked someone and I realised I’d gone wrong. I didn’t have a phone, didn’t know where I’m going…This wasn’t good! There was a farmer cutting his grass, who let me use his phone so I could look on the internet and find my way back. Then someone else who had seen me earlier stopped and helped me figure out how to get to the race course. I was embarrassed, but it wasn’t completely my fault. I wasn’t happy that I got spat off the back, and I was annoyed that the cop flagged me through at the turn. When I got back to the junction the cop was still there and he told me to turn. I thought, "Well it was a bit late to tell me now!" It wasn’t my best race, but it was definitely memorable! Other memorable races were when I won a Cat 4 Criterium Championships in New York a few years ago. I hadn’t been racing long that year, but I had very specific goals for it and it worked out that year. Then the next year when I wanted to do the whole pro thing I set out to win a State Championship race. I was very very focused on that day. I had a plan, I stuck to it, and it worked out again. I won the Cat 3 Road Championships in New York too. I am a very focused person when it comes to racing. In the summer I raced in Belgium and the Netherlands – I did nine Kermesse races in the Netherlands and one in Belgium over two and a half weeks. It’s a very intense experience, a bit shocking but the racing was incredible. I was able to line up next to world class talent, follow their wheels and learn more about racing. It was quite a challenge. The race courses were unlike anything I had ever experienced in the States. The terrain was more diverse than what I had raced before. There were bricks and cobbles and the road was was more narrow than what you get in the States. I had to take stock of all the road furniture, whereas in the States those things are often removed during the race prep by the organisers. I loved it, it made it more challenging, more fun, and made me feel like even more of a badass every time I crossed the finish line. It was a really nice boost to get some solid top tens and top twenties in UCI races abroad. This has made me a better bike racer, and I am definitely stoked on my experience. I want to push myself, challenge myself, and give myself a hard time so that I can learn to cope in hard races. Then later on I’ll have an easier time. I don’t get so nervous when racing now. I used to, but now I have learned some good anxiety management. I have a system that works for me, by just trying to be in the moment and avoid thinking about all the things that could go wrong. I have goals for each race. My goal might be just to stay towards the front, or stay with the pack – having this to focus on, stops me worrying about how terrifying it is to race at that level! Before the races there is the call-up, and the US National Anthem being played, which goes on forever. That is the peak amount of time when nerves can build up, so I try to breathe, observe, and focus on my goals that I have set. I haven’t had any life-altering crashes, but I had a rough start to the season. I was quite sick during the Fall and the start of the season, so training was really challenging. I finally felt like I was feeling better, then I crashed in February and banged my head. I didn’t have concussion but I had to take a break just in case, as I had taken a pretty big hit. At the start of this season I was ready to have a great season but I kept having all these setbacks. It’s tough when you have ideas about where you are going, but life says, not this time, you’re actually gonna do this instead! When I have set backs I just learn to keep going. My non-cycling life has always been a whirlwind of ridiculousness that I am pretty patient about things, and I am pretty good at maintaining a positive spirit and trudging on even if things are like insane. I had a particularly tough time in senior high school when my dad died and I kind of shut down as a human. Then my early twenties were really challenging. I struggled a lot with depression and anxiety and I also have serious ADHD. Dealing with so many things at the same time and not really knowing how to deal with them was hard for me, and I eventually reached a breaking point. I had been taking medication in high school but it made me feel like a zombie. I am not against medicine, as I think it works for some people, but I didn’t want it for myself. After I stopped my medicine I was floating out in the wind with all these issues and no real solution, until I saw a therapist who helped me to cope with all of that stress. So in light of that I find I can cope with things better. Where I live now in North California (El Sobrante, near Berkeley, California) is great for riding. There are a lot of beautiful quiet roads, with lots of climbing and diversity of terrain. I really like the Three Bears loop, which is a popular circuit. It’s a succession of hills that is right by my house. There is also the Skyline loop which is beautiful, in the Berkeley Hills and super close. There’s also the Redwood loop at Moraga, near the Castro Valley in little California and that extends a long way down to other routes. I will be moving soon and will really miss this area, as it has some of the best riding in the world. Other places to go riding are Colorado, which has the Olympic training centre so there are some great roads to ride there. I also enjoy the South-East – Georgia, North Carolina, and South Carolina. My favourite place to ride has to be New York City though. I think it's a great passionate community, even if there can be a lot of animosity politically. It isn't just angry biking all the time though! You can do some nice bike rides around the city, and there is a bikeshare scheme, the Citi Bike, if you don't have your own bike. I am thankful for the support I have received so far in pursuing my goal. I have a coach who understands me, I get sponsorship and support from Cannondale, Sram, Oakley, Cycliq, and Skratch Labs. I am also grateful to Robin and Wendy Groot for organising the camp that afforded me the opportunity to race in Europe this summer. As for my goal for the rest of the season? Become a better racer and focus on getting a pro contract.